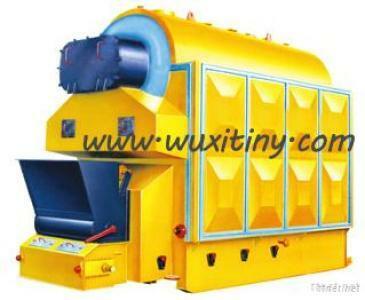 DZL packaged water-tube steam boiler is the double-cylinder, water-tube assembly, chain grate boiler. Two cylinders are laid at the upper and lower level of boiler longitudinally along the center. Front section of the upper cylinder and water-cooled tubes at side walls form the radiation-heating area in the hearth. While the rear section and tube bank in the lower cylinder serve as convection-heating area. Coal economizer is mounted at the rear of boiler. Some heat of hot combustion fume is absorbed by the hearth. Then hot combustion heat flows to the convection heating area through cooling chamber and exhausts outside with the chimney via coal economizer, dust collector and draught fan. Compact size, small installation space, single-floor boiler room, cost-effective infrastructure. Great assembly level, short installation period and cheap installation. productivity and high heating efficiency. Introduce the air with air distribution chambers of grate. All air distribution chambers can adjust the air flow independently and grate speed can be regulated in the stepless way. Wide range of applicable coals. Thorough combustion. Electrical cabinet is equipped with complete automatic control and monitor instruments featuring high automation, safety, reliability and simple operation.